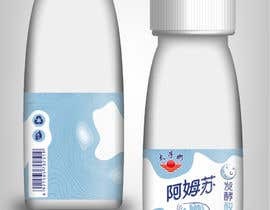 hi ，We need to design a yogurt label and its packaging box. 1, the picture need concise and fashionabl，It needs simplicity, elegance, beauty and creativity. 2, positioning: high-grade positioning, target consumer groups between 16 and 30 years ol. 2，The box is 27 centimeters high, 23 long and 14 wide. Design of winning is not bad.. But looks like completely bottle of milk! I think the contest holder gave us the wrong directive on the content. does your product has taste? or it is just plain original yogurt? Now the design is original. Tastes like Milk, because .. It's Milk ! We have selected the manuscript, please do not continue, in order to avoid wasting your time, thank you, very sorry. Please check #158 #159 #160. Thanks! A day or two, no more. Can you upload your creativity first?If the idea is simple and beautiful, and I haven't found the right one today, it can be extended. 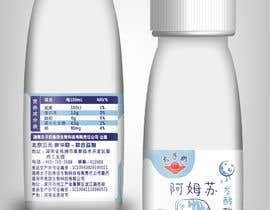 Competitor's blue can also be used, the color is now unlimited, as long as beautiful, in line with the original yogurt positioning. I saw your award winning design, simple and beautiful, very good. Please check #99 #100 #101. Thanks! Thank you so much for upgraded the contest. Please make the design style as simple as possible. The three Chinese characters are not too prominent. Hello please check #53 by Behzad K.
In addition to labels, there is a packing box. Of course, the label is well designed, and the packing box will be very easy. i am a little confused can u tell me the name or the title of the product and the subtitle . and is the red label in the attachments is the logo ? Hello, I would like to check #29. Thank You! Hello, I would like to check #27. Thank You! Do you have a three character files? Not at present, as long as the font is smooth. i am working on it.. Please keep the contest open during the competition time. Please note that this is the original yogurt, without adding fruit elements. Hi there, just uploaded a new proposal at #19 Bests! Just uploaded a new entry with corrections! #9 bests! Please take a look at my entry #8 ! hope you like it! We hope that through competition, we will find excellent designers to establish stable cooperative relations. We have much design work. Do you have pdf template maybe, and what exactly need to be on label? Some declaration or something? where is the attach file ?